KAJUKENBO is the official name of the style that has its roots in Hawaii. It is a true American martial art that originated on the tough streets of the Palama district on the island of Oahu. Several black belts from the Palama Settlement left Hawaii and went to the mainland (U.S.) and opened schools. One of those was my instructor, Tony Ramos. 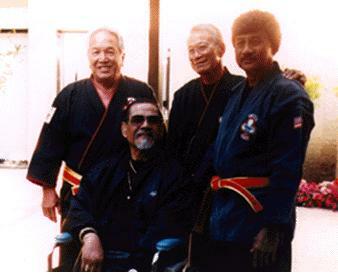 Four of the five founders of Kajukenbo, from left to right.